Beauty Wishlist #2 - Cherry Colors - Cosmetics Heaven! It's been quite a while since I posted my Beauty Wishlist #1. From that Wishlist I managed to purchase two products, both became my favorites (The Ordinary 7% Glycolic acid toner and Banilla Zero Clean it). This time my new wishlist is made of just Asian products. Don't get me wrong, I love Western products, but I've been seeing them daily and I need a change. I want to look at the pretty packaging and cure products. Join me in the exploration of my newest wishlist. 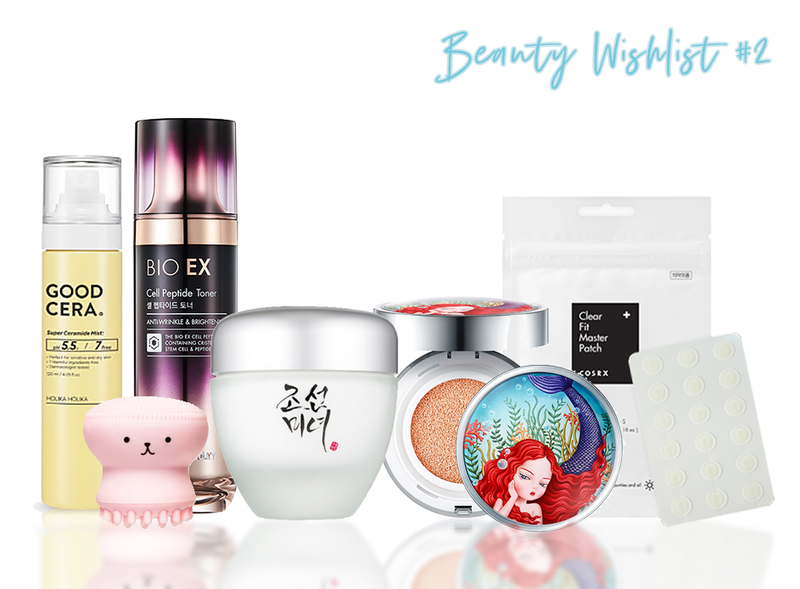 This wishlist will be divided into several subcategories; Skincare, Sheet Masks, Decorative Cosmetics and Other. I love skincare. Most of the products I already own and love are skincare products. There's nothing better than having lovely skin to put makeup on. Or just keep it bare, whatever works for me. This time I'm mostly looking at mists, ampoules and hydrating creams. There's an odd sunscreen in there too! This has been on my wishlist for more than a year. And I still haven't purchased it because of the steep price (about 25$). I put it on my wishlist because of great reviews it had. This one is a no-brainer. I liked the description of a brand that is unknown to me and I'm currently into mists. Honey always gets my attention so there's that. I loved my Good Cera cream from the same brand and again, I'm into mists right now so this sounded so good to me. If you don't know what I'm talking about or why I loved the Good Cera cream, you can check it in my HUGE SKINCARE ROUTINE post. This one ended on my wishlist as soon as it was linked in a post in a beauty group. It had rave reviews too, so now it's on my list. The description is intriguing. Also, I'm a fan of acids. With such beautiful packaging (classy, glass jar) and a reminder or Korean ancestors, it sounded wonderful. It promises to help dull skin with some brightening properties and lots of moisture. I admit. I loved the packaging. Tony Moly is usually inexpensive but this peptide mist is on the pricey side (29$). I am also a fan of peptides (which work in the long run). Oh, did I mention it's a toner? Zinc is a healing and soothing ingredient. I would like to own a cream that does just that. Helps heal the skin when it needs it. I'm thinking heavy irritations or burns. Because I'm sure that's something that can happen and I'd like to be prepared. What. I love sunscreen. I mean, I'm usually lazy about it but I'm slowly getting back into the routine of wearing it daily. Especially since now I live in a sunny place. What intrigued me about this sunscreen is the huge packaging. 200 ml of product! It's supposedly moisturizing. I'm a big fan of sheet masks. I love the moisture boost they give and they make me take those 20 minutes and just relax. That's not a lot, but I love how pampered I feel while wearing them. 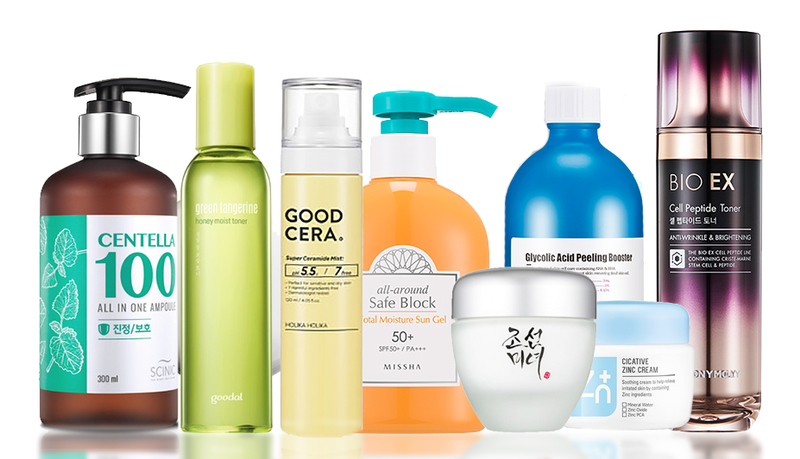 Of course, not all of them work for my skin, but I'm hoping that I'll be able to find the perfect one. There are so many different sheet masks that I'd love to try. Lastly, the A'PIEU sweet bar masks got to my attention. 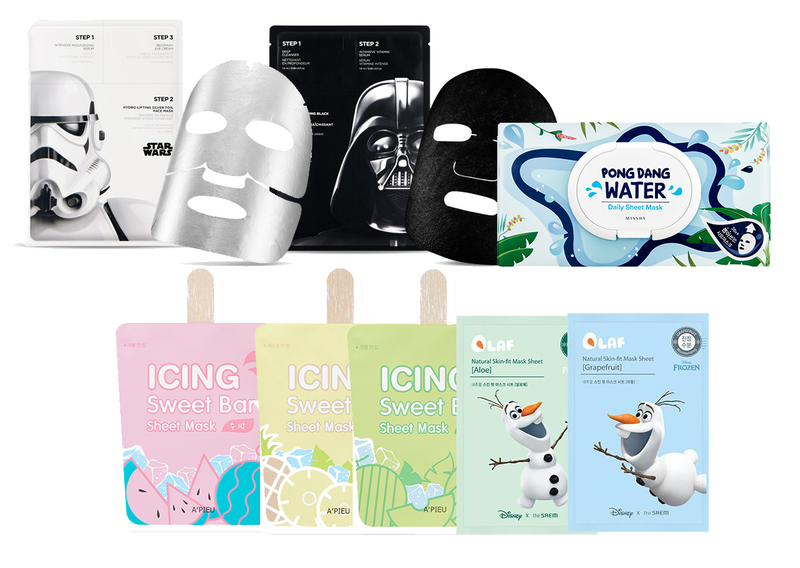 I'm also curious about THE SAEM Olaf sheet masks. I heard that Mateja is a huge fan of them. And she has lovely reviews so you should all go check her out. 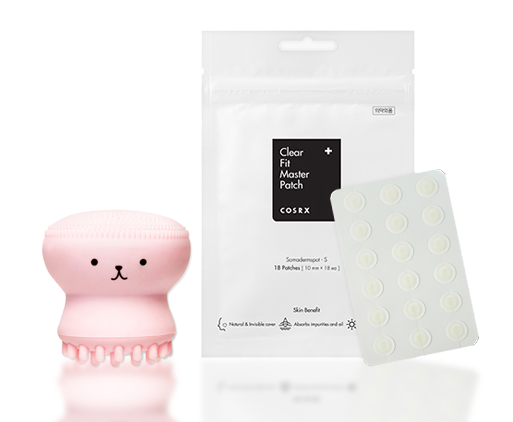 I'm also curious how would work for me the 30 days / 30 sheet masks sort of package like the one from MISSHA in the picture. I'm really not picky when it comes to sheet masks and plus, I want to try them all! I'm not sure I've tried a lot of Asian makeup. I'm mostly drawn to their skincare line as it's so different to ours. But my list wouldn't be complete without some makeup goodies in it, wouldn't it? Okay, I was drawn to these cushions just because of the design. But then I read that these are actually really good and so they ended on my wish list. 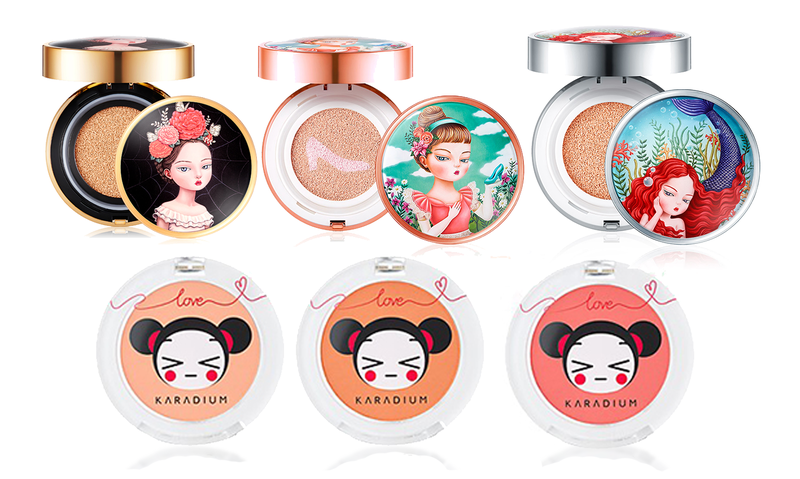 I'm the most intrigued with the Honey version (the Cinderella one) but I like the design with the Mermaid (Deep Ocean). I hope I'll be able to try one of them in the near future. Pucca is cute, Pucca is fun! And there are never too many blushes. I was eyeing the orange shades for Summer even if we're so far from it as possible. Oh well! For the things that don't really belong in any of the categories above. I am a huge fan of their pimple patches, but I head that these are practically invisible on the skin. I'm really curious how they'd work for me. I'm actually planning on getting them in the future. It's a duo sided brush for your face. The lower part where the tentacles/legs are is meant for heavier exfoliation and foam creating and the upper part is for gentler exfoliation. The upper part reminds me of a Foreo and that makes me curious to see how they would compare. Okay, this was my updated wishlist. What do you think of it?